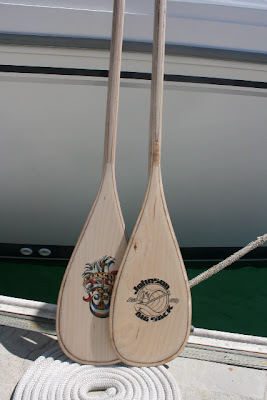 Stand Up Paddle Surfing: New Paddle Offering from Johnson Big Stick: Check 'em out! 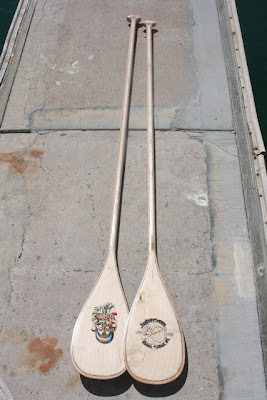 New Paddle Offering from Johnson Big Stick: Check 'em out! Don't forget to sign up for the DEMPSEY stand up paddle surf contest! 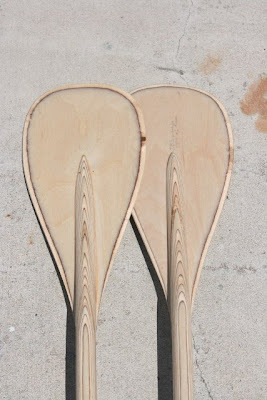 Check out these cool new wood paddles offered by Johnson Big Sticks. Even cooler is the price: EJ is listing them at $175! That's an unreal price- especially for those out there looking to enter stand up paddling with a little less damage to the wallet. Here's EJ (on the left) with Chris Koerner, first and second place, respectively, in the California Stand Up Paddle race circuit. If you're going to have a guy build your paddle, EJ is a good choice- he's both a craftsman and a paddler- he knows what you need even before you do. EJ knows a thing or two about pushing a paddle around so I'm going to bet these things are made with a lot more strength than other wooden paddles. I've been promised a demo unit (and I'll put a bend into that thing) so you can expect a full report. If you're interested contact EJ at johnsonbigstick@mac.com or give him a call at 949-412-6980. Tell him I sent you!